A vegetarian cookbook from the author of Jerusalem Cookbook and other Ottolenghi cookbooks: A must-have collection of 120 vegetarian recipes from Yotam Ottolenghi featuring exciting flavors and fresh combinations that will become mainstays for readers and eaters looking for a brilliant take on vegetables. 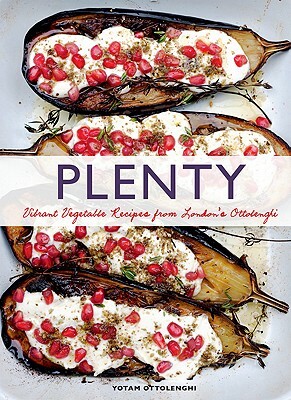 The Plenty cookbook: Plenty is the cookbook that launched Yotam Ottolenghi from a fabulous chef, London restaurant owner, and British newspaper columnist to an international food celebrity. In the Plenty cookbook, Yotam puts a spotlight on vegetarian restaurant-caliber recipes that every home cook can make. A vibrant photo accompanies every recipe in this visually stunning Ottolenghi cookbook. Essential for meat-eaters and vegetarians alike! The Plenty cookbook is indispensable for every home library. Yotam Ottolenghi is co-owner of four Ottolenghi restaurants, co-author of Ottolenghi: The Cookbook and author of the weekly New Vegetarian column in the Guardian newspaper. He lives in London. Jonathan Lovekin is a lifestyle and food photographer based in London.